WaterInnEU’s primary vision is to create a marketplace to enhance the exploitation of EU funded ICT models, tools, protocols and policy briefs related to water and to establish suitable conditions for new market opportunities based on these offerings. This project is addressing the lack of use and applicability of the research outcomes in the water management market from a different point of view and is offering an innovative and commercially driven solution. 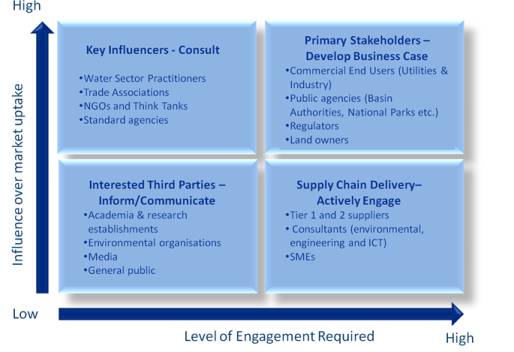 The new perspective comes from the assumption that the lack of application is not only due to the lack of knowledge and awareness about the outcomes and the results of the research projects about water, but also to the lack of an appropriate and credible vehicle for accessing these solutions in a form that best fits the needs of the stakeholders and the associated supply chain. This means a framework where the outputs of the research can reach the potential users (mainly managers and water administrations) in an applied and useful way, providing a practical and deployable solution that meets their needs and addresses their priority problems - what they need are solutions, not tools. The potential participants and beneficiaries of this project include both end users and practitioners, but also other key stakeholders with an active role to play in the regulation and management of water systems and services. 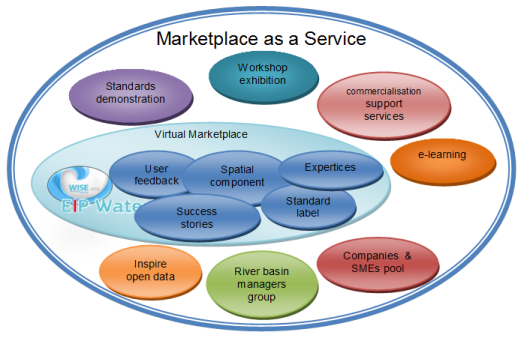 The real marketplace is composed of the market actors (mainly project responsible persons, water companies and river basin managers) and the market activities (demonstrations, workshops, networking, negotiations) and the support of a virtual web based marketplace. The proposed framework is a marketplace in which SMEs and companies are the ones who transform offerings into a service and goods will be offered as well as required services. The users (river basin district managers) want a service that allows them to find the solution to their needs (mainly, follow the EU directives and act as public servants to the benefit of the citizens). We call the solution the “marketplace as a service” (MaaS). The marketplace adds the missing link to the situation: the companies that are able to provide services to the users based in EU funded project results. SMEs and companies are the core of this project. Once integrated in the Marketplace, they have to be able to play several roles in the project that will result in components of the MaaS. This approach is one of the key points of this project where the MaaS is self-sustained by SMEs and companies contributions in the Marketplace. Several sources of data about the water theme are available. One emerging portal to get information about water is the INSPIRE data portal that concentrates the hydrographical data submitted by the member states. Additionally, the European Union open data portal is also exposing the data that the Commission is able to show. This sources, combined with more conventional sources such as the EEA Water Information System in Europe (WISE) , the Water Information Data Centre and the Joint Research Centre monitoring and water resources modelling and forecasting (for instance the Floods portal ) will also be integrated in the marketplace. WaterInnEU’s solution for a more successful dissemination and relevant commercialisation is based on a standard-based and open point of view of all ICT components. It means that standardization will affect data and metadata, protocols, processes, models, queries, etc. In this project, interoperability experiments will be conducted following the OGC methodology and under the OGC supervision as a CREAF subcontractor. The best schema for an interoperability test is a thematic Interoperability Experiment (IE). OGC will issue an open request for participation (RFP) to engage participants in this project but also to other European organizations that are willing to join the initiative embedded in the marketplace structure or international organizations that want to harmonize approaches with European. This component is developed in Task 5.2 and the outcomes of these initiatives will be a deliverable that will become also a public Engineering Report that will be maintained in the OGC public document repository after the end of the project. In this project, a “water standard offering” label is going to be developed and introduced in the marketplace as a sign of standards compromise involvement for the offering. Requirements for the label will be collected in the WP3 consultation process. The design of the label will be done in Task 5.3 and will be tested in Task 5.2. WaterInnEU will include this principle into a platform for river basin management tools and services by allowing users and companies offering services alike to transparently build up a common knowledge base. Based on experiences in the GeoViQua project it will adapt the abstract user comment architecture for the use case at hand. Besides that, collaborative approaches such as wikis can be exploited. The e-learning courses and the multimedia products will be designed and integrated in the marketplace. They will consider the different levels of expertises, such as researchers, decision makers, public and private users and stakeholders and will show how they can best exploit the functionalities of the virtual marketplace. WaterInnEU will provide specialist resources to actively facilitate the brokering of opportunities between the supply chain, the end user and the platform (and ultimately access to the originators of the tools as appropriate). These services are a unique feature of the proposition, providing active mechanisms for engaging the key market players and stakeholders, informing the development of market ready propositions, and ultimately facilitating exploitation of the tools and products. A menu of services will be developed to meet the specific needs of the platform, and will range from ‘light touch’ mentoring and facilitation through to direct ‘hands on’ support. other components are needed to integrate a virtual marketplace: •	Better multimodal search •	European funded project registration of new products •	European funded project results repository (to avoid that project results disappear when website is no longer supported) •	Spatial component: river basin maps, INSPIRE, Eurostats, EEA data representation and spatial queries should be possible. •	Other components defined during the project as a result of the project requirements process.